Orders received before 12.00 pm on working days will be dispatched on the same day, orders placed over the weekend will be dispatched on monday. 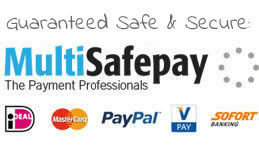 We only dispatch orders for which we have received payment. If one of the products isn’t in stock, we will contact you as soon as possible to discuss the delivery time and date. Fortunately, this rarely happens! For every shipment throughout Europe the transporter charges shipping costs which should be paid by everyone, every time. Therefore, we always charge shippings costs to be as transparant as possible to our customers. Because we use a unique software programme we can offer competitive prices for these shipments. The more you order, the less you have to pay proportionally for the shipment. The shipping costs are based on the weight and how many boxes/pallets we send to your adress. To see what the actual costs are for your specific order, you can place all the products you want to order in your shopping cart and fill in your name and address, then you’ll see the shipping costs regarding everything that’s in your shopping cart. You can add and remove products when you click on the shopping cart button before you place the order at any time. Did you place an order we have to ship outside The Netherlands or Belgium? Then you will see during the order process that there are no shipping costs charged. You can place the order and we will calculate the shipping costs after we received your order, and place a new order on your account including the additional shipping costs. Because we have several transporters we can always give you the best prices for the shipments. We ship worldwide! Orders consisting of up to 10 parcels will be delivered by PostNL. If you are not at home, they will try to deliver the packages at your neighbour. If they aren’t home either, they will try to deliver it at your address the next day. If there’s still nobody there, they will drop it at the nearest collection point. The deliverer will let you know by leaving a postcard in your mailbox. PostNL sends you an e-mail with the track & trace number so you can see online on what date and what time your packages will arrive. If you want to change the date and time you can go to their website and change it, or use their app. PostNL delivers on Tuesday to Saturday. If your order is bigger than a few boxes, then we will ship your order with Ben Becker Logistics. The deliverers from Ben Becker will only come by once. If you are not at home, we will contact you to make a new appointment for the delivery. If the second time you’re not at home, we will charge you the shipping costs once more. If you want to be called one hour before delivery, that’s no problem! You can fill in the information during the orderprocess in the commentsbox. The delivery man will contact you an hour before delivery. Ben Becker delivers on Monday to Friday. 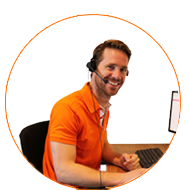 You receive an e-mail from PostNL with a track & trace code so you can see the timetable of your delivery. Unfortunately sometimes things happen which can delay the delivery. For example; wrong sorting at the central warehouse of PostNL or a flat tire of one of the trucks of Ben Becker. And no, this isn’t some kind of excuse, this really happens! When things like this happen, we can’t do much about it, except take care that it will be delivered as soon as possible. You don’t want your package to be delivered at your neighbour? You want to change the delivery date of your order? You have any other special request? Please use the commentsbox when you place an order or contact us by e-mail after you've placed your order.